Mike has a Bachelor's degree in Psychology and a Certificate in Conflict Resolution. He has over twenty years of experience as a leader in the mediation and conflict resolution field. Mike believes that education and training is largely about giving hope - people often come to a training to address a particular situation, and they want to leave with a plan to change it. In addition to facilitating workshops, he is a Mediator and also works as one of ACHIEVE’s Training and Development Specialists. Mike is co-author of the book, The Culture Question, and is the author many of ACHIEVE workshops including Emotional Intelligence and Mediation. As a trainer, he uses his experiences working in a manufacturing environment, inner-city drop-in, boys camp, and as a mediator to illustrate the material. Mike has an interactive and engaging style that easily motivates participants to incorporate workshop material into their own environments. Why do some people have trouble being effective in their roles or working well with others? It is usually not because they lack skills; rather, it is often because they lack emotional intelligence. Emotional intelligence has a far greater impact on people’s ability to be productive and work well with others than cognitive intelligence. Emotionally intelligent people are able to identify and assess their emotions and those of others, and then use that information to guide their actions and influence the actions of others. 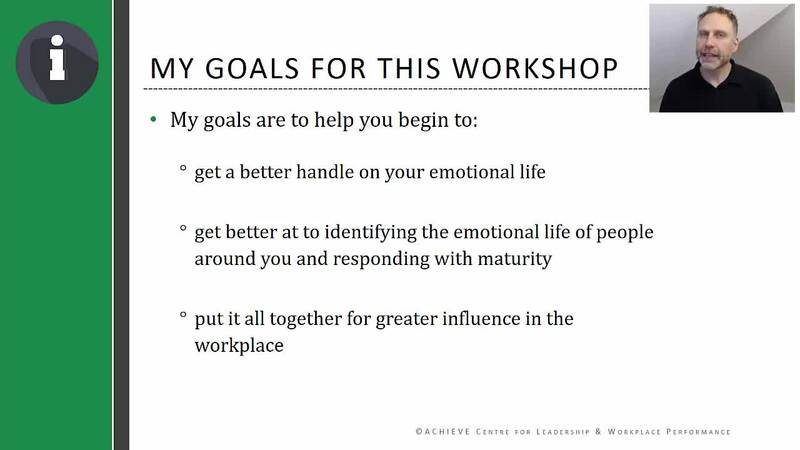 This webinar reviews how to utilize emotional intelligence more effectively through self-assessment and skill development exercises. Viewers will learn strategies that will increase their ability to engage with others and expand their influence. SKU: 44. Category: ACHIEVE Webinars.